The Beagley's Blog: Busy weekend!!! Yup! 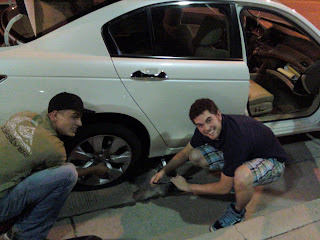 A flat tire when all we were doing was going down the street and back! ha ha just our luck and a great addition to a busy weekend! 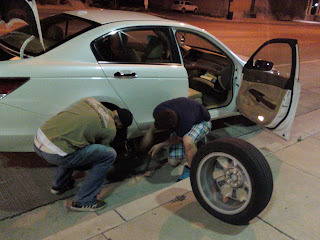 But that didn't get the boys down and they did great! 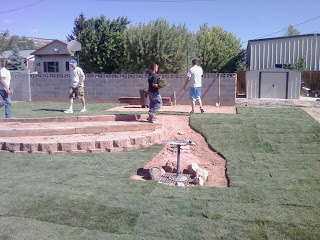 Then we woke up early this morning and helped Tyler's aunt Pam lay sod in her backyard. This was at the house that we just moved out of! 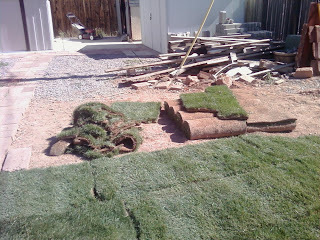 I couldn't believe the difference the sod made! The yard looks great now! 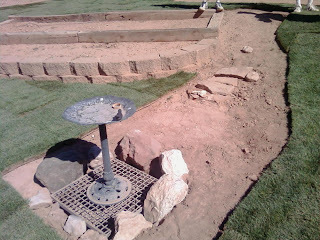 I hadn't ever laid sod before and i thought it was so cool to see the before and after! But of course i forgot to take a before pict, but here are some after picts! 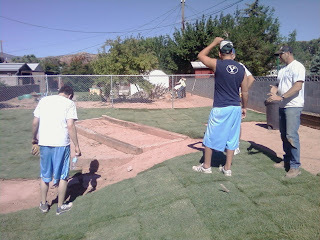 Me and Donna were the carriers, Tyler was the "decorative slant specialist", our friend Mike Costa was our "raker" and the rest of the men just laid it all out there! We all got some pizza after that Mike and Tyler went and made from Lotsa Motsa and we ended up getting done pretty fast! What a busy, productive week! I love reading all about your lives, Cor! Makes me feel like you aren't so far away after all!